Esband drive belts ensure that your production processes run smoothly, delivering precise, reliable tracking and low noise and vibration levels throughout their long service life. Each belt displays uniform elongation, tensile strength and thickness along its entire length, with no weak spots. That is why our belts are always to be found where conventional solutions fail: where the flexing radii are lowest or where there is frequently flexing on reverse bends. Our open belt drives are characterised by flexible power transmission, low shaft loads and minimal wear. They can transmit powers of up to 60 kW, or 150 kW in the case of special belts, and they are guaranteed to be temperature resistant up to 130°C. Open belt drives absorb shocks and vibration well, are extremely reliable and highly suitable for overload protection. Esband belts are the ideal solution for angle drive when the rotary axes are non-parallel. Cross belt or half-cross belt drives are the ideal solutions where the direction of rotation changes. We offer efficient drive belts with a long service lifes for multi-shaft drives with high belt flexing frequencies and several power take offs. 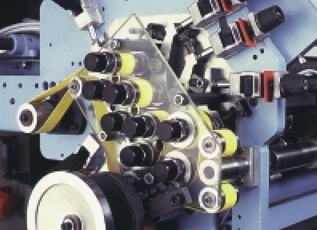 Our spindle tapes and tangential belts for the textile industry are designed for the smallest flexing radii and high tape speeds. For light-duty drives we offer belts which track very accurately, are highly abrasion-resistant, flexible and antistatic, have precisely adjusted friction coefficients and guarantee good traction. Typical applications: fast-rotating drives, office machines, household and DIY appliances, grinding machines, saws, test machines, spinning machines, dishwashers and textile machines. For medium-duty drives we offer belts which track accurately, are highly abrasion-resistant, quiet, low elongation and antistatic and guarantee good traction. They are ideally suited to use in low-humidity environments. Typical applications: fast-rotating drives, woodworking machinery, floor care appliances, DIY appliances, grinding machines, machine tools, textile machines and building machinery. For heavy-duty drives we offer belts with good traction which are also neutral running and low elongation as well as having good tractive power. Typical applications: balancing machines, building machinery, eccentric presses, woodworking machines, ventilation drives, mills and grinding gears, engine test stands, turbine drives, hydroelectric power stations and test machinery. Elastic vacuum tapes with PU (yellow) or SI (grey) coating for fixed axle bases.